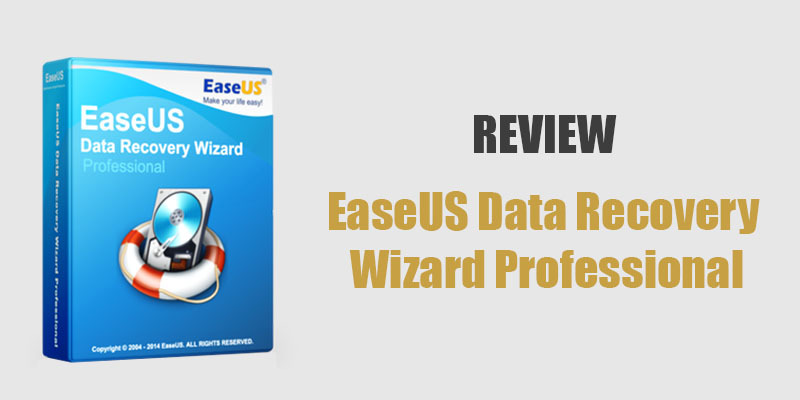 If you are in search of recovery software that can perform hard drive recovery and offer an easy-to-use interface along with user-friendly features, then the EaseUS Data Recovery Wizard is something that you should definitely check out. 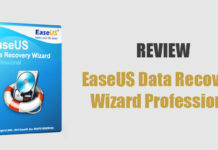 If you are unaware of the EaseUS hard drive recovery wizard, then today we bring you a detailed review of the EaseUS Data Recovery Wizard which will help you in understanding the functionality of the software better. The EaseUS Data Recovery wizard features a very basic user interface. Basic in the sense that it is quite easy to operate and requires minimum interaction for data recovery. Once you install the wizard on your system and launch it, all you need to do is to select the hard drive in your PC on which you wish to perform the hard drive recovery task. Even though there is are quick scan and deep scan options available in this recovery software, it is to be noted that a quick scan does happen before entering the deep scan procedures which makes having two separate options pretty much unnecessary. 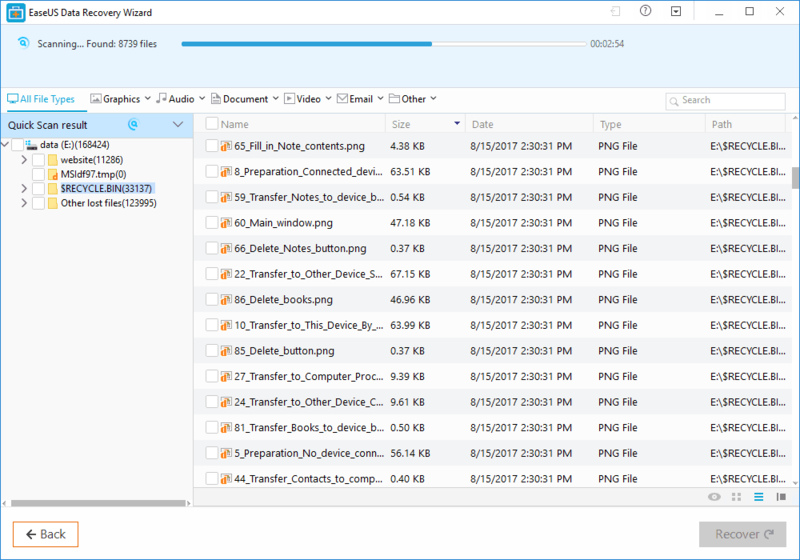 Talking about the features of the EaseUS Data recovery wizard, the software does offer almost every feature that one would expect from recovery software and hard drive recovery software. Below are the features of the EaseUS Data recovery wizard. Ability to recover deleted, inaccessible, and formatted data from any hard drive. 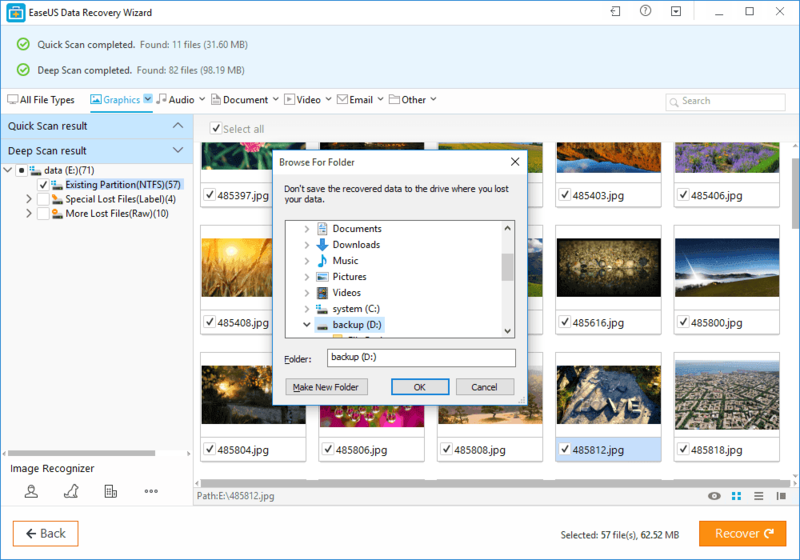 Recover any file types including documents, photos, audio, video, compressed files, and emails. Email recovery possible from Outlook Express and MS Outlook. Easily perform hard drive recovery on desktops, laptops, external hard drives, external storage devices, RAID, media server etc. Ability to recover deleted, lost, hidden data from lost hard drive partition. Deep level scanning of hard drive to recover long-lost data. Ability to import and export scan results for future reference. Even if the system does not boot or crashes during boot, you can perform hard drive recovery using this recovery software. The main highlight of the EaseUS Data Recovery Wizard in terms of performance is that it does not take much system resources while execution. Which means you can run a deep scan for hard drive recovery using this recovery software and still run other normal applications and features of your system without having to worry about slowing down your system. Also, talking about the recovery procedure, once you select the hard drive or source that you wish to recover data from, the time that the procedure takes to complete very much depends on the content that is available in the selected source for recovery. But from our experience of the software, we can report that it does not take quite long for scanning a hard drive and a typical deep scan of a hard drive should be completed in about 2 hours. After the scan is complete, all the data that are recovered are categorized as Lost Files, RAW Lost Files, and Special Lost Files. This categorization makes it easier to find the file that we are looking for. Also, recovering the found data is successful almost all the time even though at times the recovery may yield a corrupted file or partly corrupted file mostly if the recovered file was deleted from the system or hard drive long ago. This problem happens with every recovery software out there so there is nothing to complain about here. Despite being very easy-to-use recovery software, there is a very extensive customer support that is made available by the team. The customer support can be approached for any issues that you may face either via email, phone, or also by making use of the 24/7 live chat support. As normal free version users rarely would require customer support in running the software, the customer support structure is more oriented towards helping the technician and pro level users with all their concerns. However, there is no separation for the customer support offered and even free users can make use of the customer support any time they want help. The EaseUS Data Recovery wizard is completely free to use on both Windows and Mac devices. However, there is a maximum data limit of 2GB that can be recovered using the free version. After reaching the maximum limit, a premium subscription has to be purchased. The price of the premium offerings of EaseUS Data Recovery wizard depends on whether you choose Windows or Mac. Below is the pricing for the premium EaseUS Data Recovery wizard. The Pro version for Windows and Mac are priced at $69.95 and $89.95 respectively. You can also get a bootable Windows or Mac media along with the Pro version of the recovery software for $99 and $129.90 respectively. The above-mentioned premium versions are single-licensed and if you have an establishment that requires a professional-level license of the EaseUS Data Recovery wizard, then you can opt for the Technician version for $499. EaseUS Data Recovery Wizard is one of the very popular recovery software out there for not just hard drive recovery but almost any sort of recovery from Windows and Mac systems. We hope this review helped you understand the features and benefits of this recovery software. If you have any doubts, do leave a comment below raising your question and we will surely respond with appropriate answers. You can download or buy this software from here.